How many of us have taken stock of our bank accounts and said, ah, it all went wrong the day I heard my first great sound system? Most of us will probably spend far more than we need to arrive at a point of equilibrium - if we ever do. Incorrigible gear flippers like myself might be beyond redemption. But what if we could build a high-quality system for under, say $3'500 and save a few newcomers to this hobby some serious coin? I would place the $1'299 Coincident Dynamo SE on a very short list of contenders for amplification. Then we would need to find an affordable DAC. Perhaps I would choose one from MHDT Labs, Schiit, Musical Paradise or Resonessence Labs. Next we need a high-sensitivity speaker. The $650 Tekton Design M-Lore works for me and a small Zu might work for you. Finally, we could grab some cable from Connex (PartsConnexion’s brand), Kimber or DH Labs and voilà, we’d be done. I think most of us should be content to stop right there, get off the merry-go-round and simply enjoy our music. But most of us won’t do it. We won’t believe that, with certain limitations, a $1'299 Canadian-made Dynamo can deliver, across a wide swath of musical genres, perhaps 80% of the sound of many five-figure amps and 95% of the sound where solo guitar and piano are concerned. We won’t believe that we can get the purity of tone, the sense of space, the PRaT, the inner detail, the fatigue-free musicality, the druggingly delicious sweetness that single-ended tube amps provide. We won’t imagine we can get life-like vocals, a realistic guitar pluck, the long decay of a single piano key, a realistic double bass arco or banjo hammer-on in our listening room. And even if we do believe it, we will crave that remaining 20%. Some industries employ planned obsolescence to survive. Our industry needs no such thing to thrive. It can rely upon the indefatigable curiosity of its client base, upon people like myself who revel in flipping amps, speakers and DACs like flapjacks. But for the strong-willed frugal ‘philes among us, here is your amplifier - the Coincident Dynamo SE. If you listen to music in a small to medium room or have highly sensitive speakers placed in a large room, you will be hard pressed to find a significantly better amplifier for under $4'000. You can certainly play hard rock and orchestral music with this amp but obviously are not going to plumb the netherworlds of the lowest octave with eight single-ended watts no matter how beefy the power supply. But you will be surprised at how low this amp digs down into demanding music. Israel Blume founded Ontario-based Coincident Speaker Technology 21 years ago. He is living proof that manufacturers of audio equipment in high-wage nations can still compete on the global stage at any price point. Coincident began with speakers and today can boast a long line of award-winning models starting at $2'999 and culminating in the Pure Reference Extreme at $26'999. As Blume’s stable of speakers garnered praise and awards, he branched out to create amps to drive them. The brothers Frankenstein emerged from the lab to great acclaim. I refer to the $5'999 (including freight) 300B-based mono blocks regarded by some reviewers as one of audio’s best buys. These relative lightweights come in at ‘just’ 15.5kg each. With their big brother, the $5'999 (including freight) 45kg Turbo 845 SE integrated amp, Blume comes within a whisker of matching the pricing of heavy high-quality 845-based amps made in China. 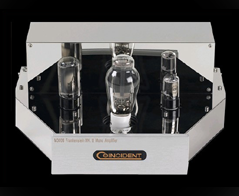 Coincident’s flagship amp is the 200-pound mono 211PP Dragon Mk. II which retails for just $10'999 (including freight). Anyone who has heard the Dragons at a show knows they pack brute power with SET-like tonality. With the Dragons, we enter the audio world’s highest echelon. 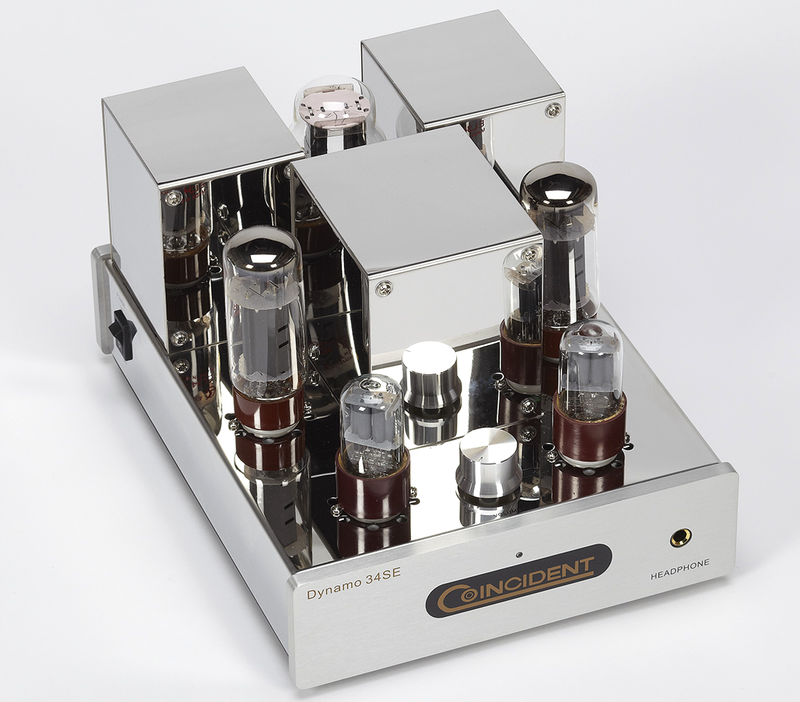 Given their parts and sound quality, the Dragons could easily fetch two or three times their asking price.Last but certainly not least, Coincident makes a step-up transformer, a remote-controlled preamp, a $5'999 phono preamp and a $5'499 preamp with the 101D tube that many believe to be amongst the best in the world regardless of price. 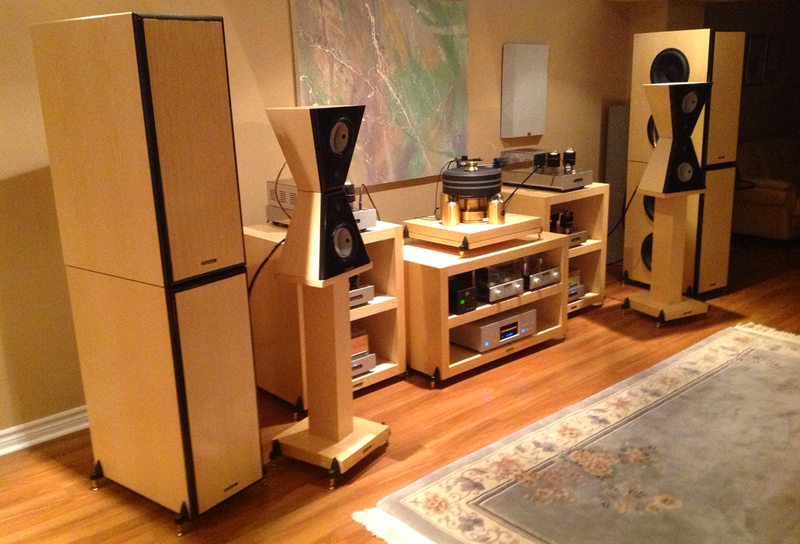 There is a common thread: top-shelf sound at real world prices. Indeed, Coincident is Canada’s Harbeth, a well-established firm with an award rap sheet as long as one’s tone arm but with prices—eureka—that seem to have a clear relationship with costs and which have remained stable over a decade even in the face of rising demand, currency fluctuations, rising parts costs and universal acclaim. Buying directly from Coincident means more money in your pocketbook. Admittedly, Coincident is a well-established company that perhaps can afford to carve out a niche for a low-profit product. Is the Dynamo a teaser, designed to hook the user with an affordable taste of the high life and make him a lifelong Coincident user? Perhaps. And if so, God bless the pusher man! In any case, the motivation for releasing this sort of product at this low a price is beside the point. How many other top-tier producers whose speakers and amplifiers are held in the highest esteem have put to market a product worthy of the company name at just $1'299? Perhaps Goldmund’s Job products come close (I have not heard them). But a company making $120'000 speakers that introduces $20'000 ones, you say? That doesn’t impress me too much. Let’s put aside my cynicism and take Mr. Blume at his word. In an email interview he told me: "Our goal in creating the Dynamo was to offer high performance, stunning aesthetics and superb craftsmanship at an entry-level price point. Doing so was only possible due to a very low mark-up structure and economies of scale." 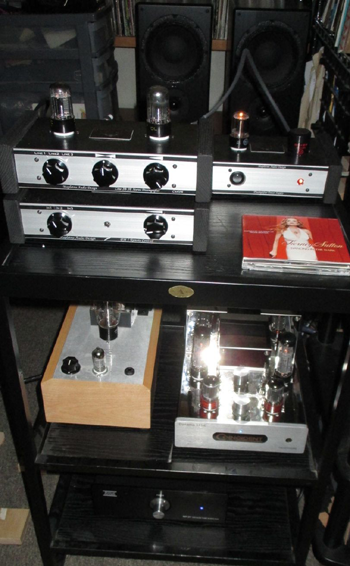 He continued: "We wanted to finally permit those audiophiles who always wished to purchase a high-quality tube amplifier to do so." Ambitious goals. 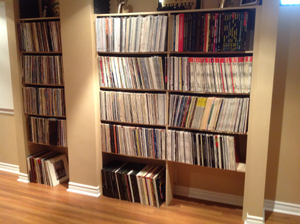 I do believe Mr. Blume has realized them [part of his record collection at right]. Consider what your $1'299 buys. For starters, beefy transformers wound in Japan to Coincident’s specifications using high-quality copper. The amp is rated at eight watts but swings ample current to sound much more powerful. The Dynamo’s footprint is smaller than a sheet of A4 paper but weighs 10 kilos or 22 pounds. It sports high-quality binding posts and a highly responsive volume pot. There are 4 and 8 ohm taps. Next, behold the high-gauge stainless steel casework. It is stunning. This is one tasty piece of prime rig. Throw in costly French capacitors and metal film resistors matched to within 1%. 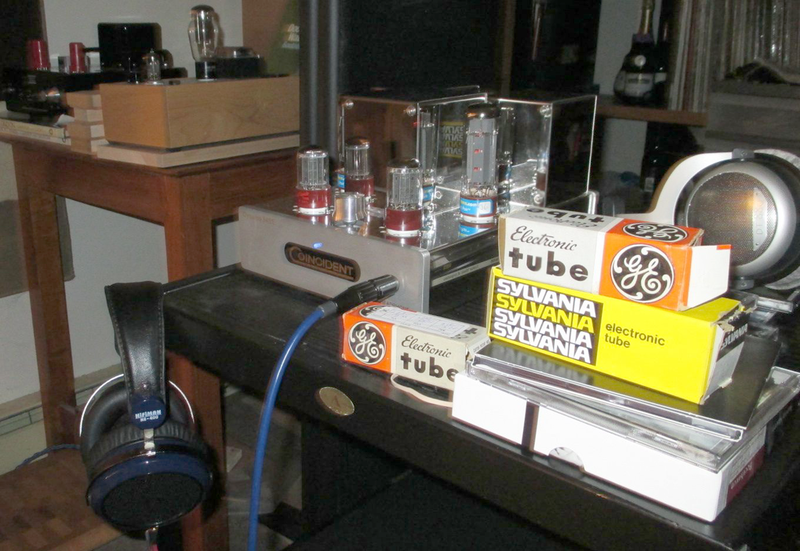 It’s cheaper to employ solid-state rectification but Blume chose tube rectification to get the sound he desired. 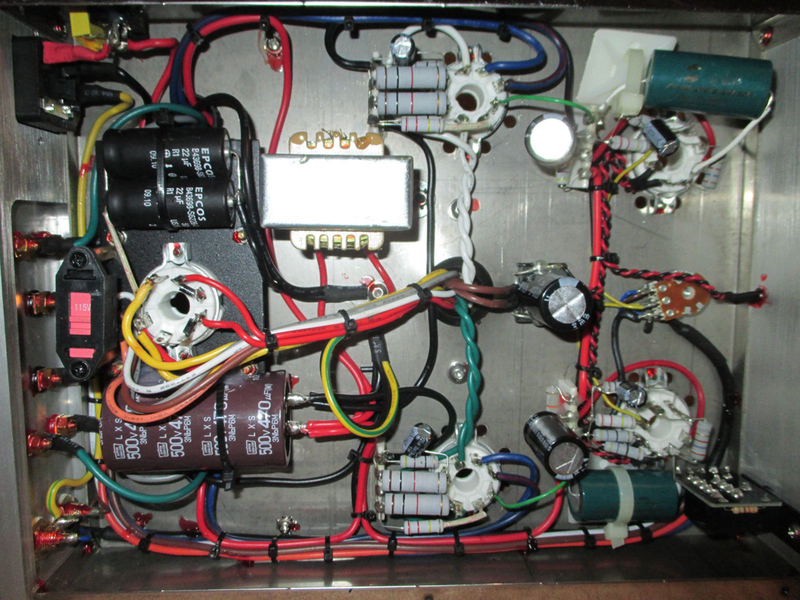 Observe the short signal paths, the tidy wiring, the attention to detail, the use of damping adhesives. Compare it with the sloppy spaghetti innards of some Western-made budget-priced direct-sold amps. The retail price of the perfectly good stock tubes, all current production from Shuguang, is about $100. Re-tubing will be a piece of cake. You can roll readily available and cheap EL34. You can use the 5U4G or 5AR4 rectifier and the lovely 6SL7 which opens the door to one of the greatest high-MU twin triodes ever made, the compatible RCA 5691 red base. Online, $50 suffices for a pair of NOS 6SL7 from several makers including Sylvania. I found that the RCA 5691 red base elevated the amp to a much higher level, adding smoothness as well as increased resolution particularly with guitar and piano. I found the 5691 made woodwinds sound fuller and reedier. The Dynamo is auto-biased and has a variable 100k-ohm volume pot "to allow", Blume notes, "passive direct connection to an input source". The EL34 are strapped for triode mode. The icing on the cake? A robust 300-ohm headphone section that blows my Bottlehead Crack out of the water, wipes the floor with the headphone section of my Audiolab M-DAC and kicks sand in the face of my comparatively weak Musical Paradise amps. The Dynamo’s head amp has seemingly unlimited drive and crystal clarity. It is dead quiet. You can request a different impedance to match your headphones. I found the Dynamo worked perfectly well with both high and low-impedance cans from Beyerdynamic and HiFiMan. I got speed, deep bass and a highly extended treble through my headphones. The only potential ergonomic issue is the volume knob’s location. One might think it awkward to turn a knob located between two tubes. At first it is but you’ll get used to it. 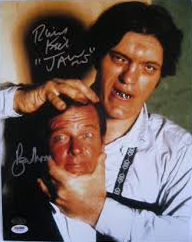 With my Richard Kiel-like hands (may he RIP), I had no problems. There is no remote but for the price one cannot complain. If it’s a remote you crave and if you already possess a preamp, then simply crank the volume pot open and use the Dynamo as a power amp. It worked wonderfully with my Audio Research LS17 preamp and it dazzled with a Mapletree Audio Line 2BSE with the RM 1 remote which uses the Bent Audio motorized Alps audio taper potentiometer. Perhaps the EL84-based Japanese-made Almarro A205mk2, a 5.6wpc single-ended amp, can compete. I had one of those in the house for about seven months. It was a marvelous amp but the headphone section buzzed like a bee hive and the cheap jack was located at the back of the amp. And it is not nearly as powerful as the Dynamo. In the USA, the Almarro retails for a little less than the Dynamo. In Canada the price is higher. After that there are the eBay offerings of Dennis Had aka radioman731. Had is the former head of Cary Audio who now makes single-ended pentode and tetrode amps in his retirement. Had’s amps reportedly sound great but unlike the Dynamo, they have a DIY look to them. And the power amps do not come with a headphone port.